Most university department websites are, to be blunt, unattractive and underwhelming. It’s a blunt assessment, but it doesn’t take a lot of browsing around to see that it is true. 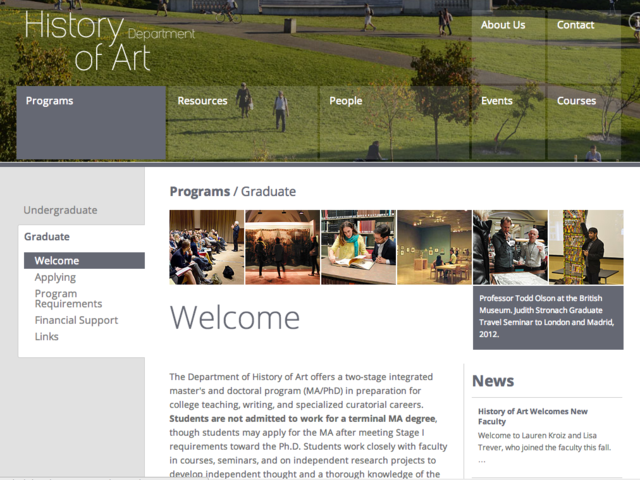 For the University of California, Berkeley History of Art Department, it was time to break out of the ‘ugly and hard to update’ model that is the curse of utilitarian websites. Fortunately, the department had a team with a vision for something well beyond the typical department site — and funding for doing it well. Lynn Cunningham, the Principal Digital Curator for the department, led the project. The department’s previous site had been built by a volunteer as a set of static HTML pages. The site had lots of content, but it was hard to update and didn’t reflect the department’s sense of aesthetics. To supplement that site, Lynn had built a separate site for the visual resources center, using the self-service online tool Weebly. This companion site was a lot better looking than the main site, but it was limited and disjointed. Webvanta worked with Lynn and other department members to review all the content on the existing sites. We then created an information architecture, a database design, and a set of functional specifications to document all the requirements. The department hired Francisco Aveledo of FA Design in Barcelona to create a new visual design that fulfills these specifications and is both unique and beautiful. Francisco’s designs delivered spectacularly on those goals. The home page takes a radically different approach than most sites, using an array of large navigation buttons and a few small content areas. 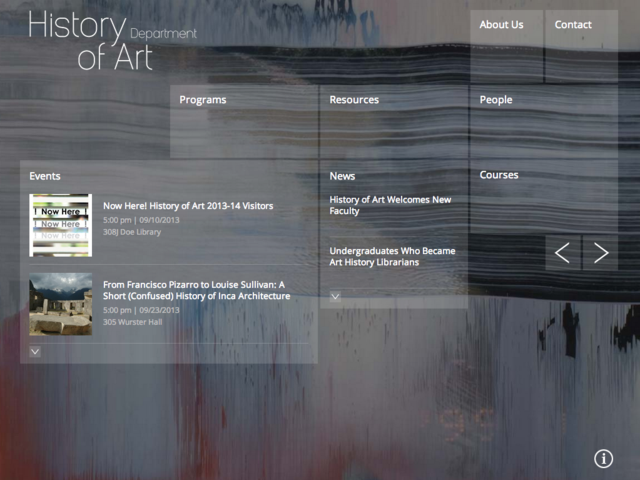 Artwork is prominently featured as a background slideshow that fills the entire browser window. On the interior pages, the design is more traditional, but the nav bar retains a distinctive design with large, transparent buttons and different background images for each section. Many interior pages have an additional row of thumbnail-sized images in the content area, further increasing the visual richness. Another unusual feature is the display of art credits throughout the site. Whether it’s a background image on the home page, a menu-bar background on an interior page, or a strip of thumbnails in a content area, every piece of artwork has credits that are displayed on hover. Several aspects of the database for the site required special treatment. There are different sorts of profiles for people in different roles — faculty, staff, students, etc. Faculty and staff can edit their own profiles, using individual log-ins. The course database is built into the site, because the department wanted to provide more information than is in the University’s central database. But for certain information, such as schedules and locations, they wanted the information to come directly from the central database. Unfortunately, the University doesn’t yet make this information available through any kind of API, so Webvanta built a ‘scraper’ that runs once a day to access the pages on the University’s central course website, extract the schedule and location for each course, and update that information in the department website’s database. One more data integration was for an existing blog. The department wanted to continue using that blog, but include its posts on the new site as well. The Webvanta platform’s ability to import content from an RSS feed made this a snap. Another unique requirement was to enable faculty members to submit requests for scanning of artwork from books and slides. This is an important service the department provides to its faculty, providing rich imagery for lectures and research. 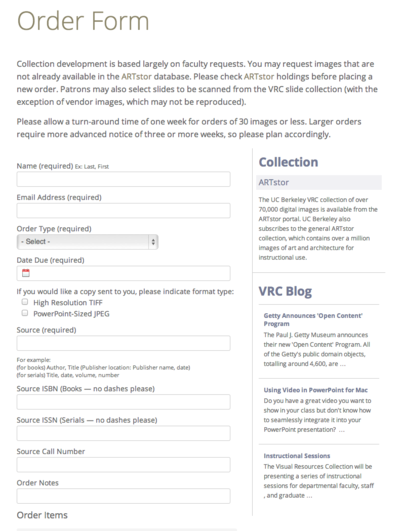 A highly customized form captures the information the department needs to fulfill these requests, and then delivers the information in a format that can be directly imported into their ARTstor system, into which the department has already has scanned 70,000 images. This site provides a great example of where the Webvanta CMS and development approach shines. Our discovery-and-specification process facilitated a crisp definition of what was needed. Our client was able to pick the designer of their choice, without needing to find one who could also handle all their implementation needs. The Webvanta platform empowers all of the staff to edit content, and custom extensions provide specialized integration with existing content sources. And because the ’http://www.webvanta.com/hosted-cms’>Webvanta Cloud CMS is fully managed and hosted, the department has no technology worries or dependence on IT staff.